Paris is a beautiful city to travel around no matter how you do it! Using a guided bus tour here is a great way to see the city and jump off to visit the many sights on offer. We have pulled together all the details here to help you decide which is best for you. Four main companies(Paris L'open Tour Hop-On-Hop-Off, Big Bus Tour, Open Bus Paris, and Paris Foxity Bus Tours) offer bus tours in Paris. They all cover the main central sights but check the route details here to see which fits with your plan. 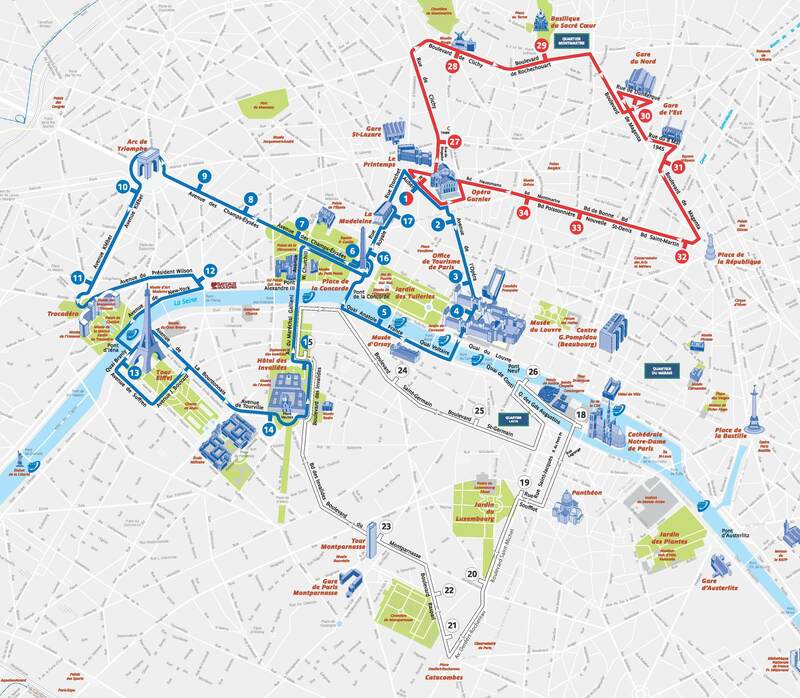 Paris L'Open has the biggest route offering and flexibility, but Foxity Bus Tours offers some good value pricing, including a short 2 hour only tour, if this works for you. Paris L'Open comes with a discount with one of the citywide attraction passes and Big Bus is included free with another. Combining touts and attractions in this way can be a good money saver! Check out our guide to attraction discount passes to see if this works. Where to Buy Paris Hop-on Hop-off Bus Tour? What is it? Paris L'Open bus tour features 4 routes covering all the major attractions in Paris. It offers audio commentary through headphones in 10 languages and includes recorded stories about Paris for kids. Other facilities with this tour include free Wi-Fi and discount vouchers for attractions and restaurants. Big Bus tours offers unlimited hop on hop off tours in three different routes covering over 50 attractions. Complimentary offers include a walking tour, optional Seine river cruise, free map, and a voucher booklet containing attractive discounts in restaurants and attractions. The Open Tour Paris Hop-On-Hop-Off Bus tour is a great way to explore and discover the city of Paris, this hop-on-hop-off bus tour covers the highlights and attractions in the city with 4 routes and 38 stops. Explore Paris both in the day and at night with your 1 to 3-day tour around the city's splendor and nightlife magic. Tourists can hop on and off to closely appreciate sights as they take pictures as well. This is an awesome way of getting accustomed to this beautiful French city at your own pace. Get on the Big Bus hop-on-hop-off tour and explore Paris with a 1-or 2-day pass and skip-the-line at one of the worlds largest; Louvre Museum. Hop-on and off the open-top double-decker bus as you travel along many stops across the city. Travel along two routes (red and blue routes) while listening to the onboard audio commentary in 11 languages with free headphones and also enjoy free Wi-Fi aboard to share your story with friends and family online. Take the red route and see jaw-dropping attractions and famous monuments in the city such as the Eiffel Tower, Notre Dame Cathedral, the Arc de Triomphe, The Louvre and many others. The blue route also has amazing places and attractions to see like its famous bohemian part of Paris known as the Montmartre. Marvel at the Moulin Rouge, the Basilica of the Sacred Heart. Explore the Louvre Museum and see its over 400,000 exhibitions and collections on display in the Glass Pyramid-shaped museum. It has a collection of arts from the 18th century, ancient Christian and Islam arts, and many more. Tour Paris at your own pace with a 1- or 2-day big bus hop-on-hop-off sightseeing ticket, with express entry to the Eiffel Tower. Get on the bus for a wonderful drive around 10 stops in the city, with a live English guide on the bus and audio commentary in 8 different languages. Enjoy free Wi-Fi on the bus and shares your moments with friends and family, get off the bus at any of the stops and explore on foot to see places like the Champs-Elysees, the Arc de Triomphe, the Louvre or the Eiffel Tower and many more. Skip the long queues at the Eiffel Tower with express entry to the first floor and enjoy an amazing lunch at one of the most famous monuments in Paris. End your tour with a 1-hour cruise along the Seine River and marvel at the iconic attractions, landmarks and the beautiful city of Paris at night; also known as City of Lights. Tourists may board the tour bus at any of the approved stops, by exchanging their voucher directly with the driver. You can start and end this tour from any of the stops approved stops. 21 Avenue de la Bourdonnais and buses return back to the same point. Paris L'Open Tour offers onboard commentary in 11 different languages. Paris Big Bus Tour offers onboard commentary in 11 different languages. The Open Tour Paris Hop-on Hop-off bus tour offers onboard commentary in 9 different languages. English, French, German, Spanish, Italian, Russian, Japanese, Portuguese and Mandarin Chinese. Stories about Paris for children in kids' commentary. Wi-Fi, Discount Voucher, Mobile tickets allowed, and Wheelchair accessible. Valid 365 days a year. Tourists are to be at the boarding point 10 minutes before departure. To get the full refund, cancel your Big Bus tour ticket 24-hours before the main tour. If you book for a 2-day pass, the Eiffel Tower will be booked based on availability on day 1 or 2. Show the printed voucher to the bus official. Tourists can exchange their booking voucher for the Open Tour Paris Hop-On-Hop-Off Bus Tour ticket at any of the stops. By simply choosing the stop you wish to start from and the driver will exchange it for a ticket valid for 24 or 48 hours from that time. Both paper and printed paper vouchers are acceptable. Only paper printed vouchers are acceptable for this tour. Exchange it for your tour ticket at the departure point (21 Avenue de la Bourdonnais). 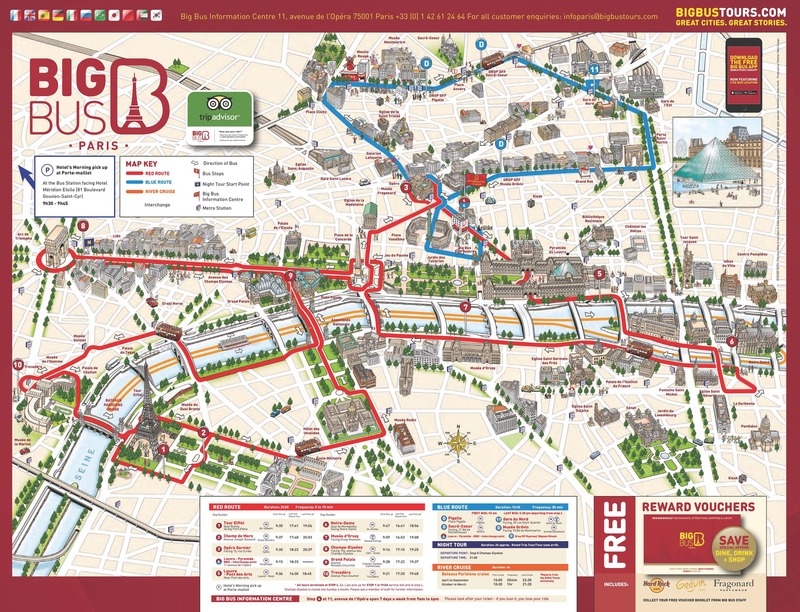 Where to Buy Paris L'Open Hop-on Hop-off Bus Tour? We are comparing the Best Hop On Hop Off Paris City Sightseeing tour Prices from leading online Tours and Ticket suppliers, try to find you cheap tickets prices on the market. Where to Buy Paris Big Bus Hop-on Hop-off Bus Tour? Where to Buy Open Bus Paris Tour? Where to Buy Big Bus Tour + Louvre Museum? Where to Buy Big Bus Tour + Eiffel Tower + Cruise? Paris L'Open Sightseeing bus tour is an ideal way of getting around in the French capital. With 4 available routes, tourists can discover the city and tour all significant landmarks and attractions in an efficient manner. And not just that. Paris L'Open bus service features dozens of stops throughout the city. Hence, you have a liberty to adapt the sightseeing however it suits you best. Touring Paris and examining its points of interest from a double decker bus. A choice among 1-, 2- and 3-day sightseeing passes. The longer the validity of the ticket, bigger the savings. Conveniently deployed stops next to spectacular landmarks, magnificent parks and gardens, and extraordinary museums. You will see the Eiffel Tower, Triumphal Arch, Louvre, Champs-Elysees, Montmartre and other popular sites and places. Learning interesting facts about Paris through audio commentaries in 10 major languages in the world. Entertaining narrative for children in English, French and Spanish. The largest number of stops among available bus tours in Paris. Children (4-15) pay the same price for 1-, 2- and 3-day tickets. Younger children have free bus rides. Bus stops: Notre-Dame, Petit-Pont, Maubert-Mutualite, Pond de Sully - Ile Saint Louis, Bastille-Opera, Gare de Lyon, Jardin des Plantes, Bibliotheque Nationale de France, Parc de Bercy, Bastille - Rue Saint-Antoine, Le Marais and Hotel de Ville. Bus stops: Petit Pont, Luxembourg, Observatoire, Place Denfert-Rochereau, Raspail-Cimetiere du Montparnasse, Montparnasse, Esplanade des Invalides, Rue du Bac, Saint-Germain-des-Pres, Cluny-Quartier and Notre-Dame. Bus stops: Auber, Trinite, Blanche, Montmartre-Anvers, Gare du Nord, Gare de L'Est, Republique, Bonne-Nouvelle, Grands Boulevards, Italiens, Capucines-Scribe and Madeleine. Bus stops: Auber, Opera, Palais Royal, Musee du Louvre, Pont-Neuf, Notre-Dame, Saint-Michel, Musee d'Orsay, Concorde, Champs-Elysees, La Boetie - Champs-Elysees, Arc de Triomphe, Charles de Gaulle-Etoile, Trocadero, Tour Eiffel, Vauban-Hotel des Invalides, Esplanade des Invalides, Concorde-Royal and Madeleine. TripAdvisor Reviews: This bus sightseeing service has an average rate of 3.5 (over 2800 reviewers) on TripAdvisor. The percentage of fully-satisfied customers is 27%, while 31% of past travelers rate the bus tour as "very good." "Excellent way to get to see Paris and the highlights. Three separate routes that covers most of the highlights. Buy the combined night tour/day pass especially in December to see the lights of the season. Has good narration in many languages. Drivers are friendly and helpful. Be aware that the evening tour does have an assigned date and we were unable to change the date to better serve us. Unless we had asked at the main office at the beginning of the Red/Blue line, we would not have know. We were fortunate that there was a stop right outside our hotel in the Republique district. Buses ran about every 1/2 hour." Viator Reviews: If you refer to this website for online bookings, you'll find that people who used this bus service are much more satisfied. Some 2300 reviewers rated Paris L'Open Bus Tour with the 4.5 rate. Get Your Guide Reviews: The big satisfaction with this bus sightseeing service share users of the Get Your Guide booking engine. They rated the tour with the average rate of 4.4 (over 1500 travelers). Users of the Paris L'Open bus service have the biggest flexibility to organize their sightseeing. This provider has the largest number of available routes and stops in Paris. Besides pre-recorded commentaries in 10 languages, only this bus tour offers narratives in 3 languages suitable for children. Also, travelers benefit of free Wi-Fi on board every bus. In addition, users of L'Open Bus sightseeing service benefit of discounts at some partner restaurants and attractions. Furthermore, the same price of every children ticket (1, 2 and 3 days) is a big bonus for families. Is the L'Open bus sightseeing Right for Me? This tour covers all tourist areas and passes by all must-see attractions of the French capital. It disposes of audio commentaries in all widely-spoken languages. Finally, the children pay the same price regardless of the duration of the ticket. Hence, L'Open Tour is ideal for travel enthusiasts, fans of art and families alike. Paris Big Bus Hop-On Hop-Off Bus Tour is the bus service touring top attractions of the city. With conveniently placed stops and departure intervals, the service offers a great manner of exploring Paris by combining a bus ride and walk. With optional cruise and museum tours, it provides an in-depth overview of some of the French capital's top attractions. Unlimited Paris sightseeing by bus during the validity period. You can take a full loop or alight along the way and continue the ride later. Flexibility in organizing your time and sightseeing. A free 1-hour walking tour. An optional river cruise (with the specific ticket). An optional visit to the Louvre (with the specific ticket). The Night Tour (without stops) with the separate ticket. Choice between 1-day and 2-day sightseeing passes. Audio commentary on board every bus in 11 principal languages in the world. Touring the Eiffel Tower, Triumphal Arch, Louvre, Montmartre, Champs-Elysees and other key points of interest. Discounts at specified attractions with complimentary voucher booklet. The 1-hour Seine River cruise with Les Bateaux Parisiens for holders of specific passes. The 1-hour free walking tour departing from the bus stop near the Notre-Dame Cathedral. An entry ticket to the Louvre Museum with the specific ticket. We are comparing the Best Paris Big Bus Hop-on Hop-off Tour Prices from leading online Tours and Ticket suppliers, try to find you cheap tickets prices on the market. Bus stops: Eiffel Tower, Champ de Mars, Opera Garnier, Louvre-Pyramide, Louvre-Pont des Arts, Notre-Dame Cathedral, Musee d'Orsay, Champs-Elysees, Grand Palais and Trocadero. Bus stops: Louvre, Moulin Rouge, Sacre Coeur, Gare du Nord and Musee Grevin. TripAdvisor Reviews: Past users of the Paris Big Bus sightseeing tour have rated this service with the 3.5 rate (around 2600 reviewers). The number of extremely and very satisfied users is almost identical (34% and 31% respectively). The number of unsatisfied customers is within usual limits. Was approached by a staff named Gerard outside the Eiffel Tower. He explained everything very well, showed us how to do everything, and was clear and thorough. I took the tour with my family and it was great. Hop on and off anywhere there's a stop in Paris. Much cheaper and more effecient than taking the metro or taxis. It stopped at all major sites and if you do the 1 day pass plus the boat tour you won't be disappointed! Viator Reviews: By referring to this online booking service, you will find that over 800 reviewers have rated Paris Big Bus Tour with the average rate of 4.5. Get Your Guide Reviews: The users that booked the Big Bus Hop On Hop Off Paris Tour assessed the quality of service with the 4.4 rate (510 reviewers). The Paris Big Bus Tour offers fast transfers between top attractions of the French capital. Also, this service features the most frequent departures of all Paris bus tour providers. Additional convenience the Big Bus Tour offers is a reservation of the Seine River cruise or Louvre ticket in a single place. That way, you save time. Furthermore, this sightseeing bus tour provider has the largest number of audio commentary languages (11 in total). That way, you have the biggest chance to learn about the city in your native language. Travelers also benefit of free Wi-Fi on board the bus. Also, the Big Bus Sightseeing Tour has a Night Tour (with a separate ticket), which reveals Paris when it is enchanting the most. Finally, the holders of the Paris Pass have a 1-day hop-on hop-off bus sightseeing tour included with the pass. Is the Big Bus hop on hop off Paris Right for Me? This bus tour is suitable for people with limited time wishing to discover Paris in as quickly as possible. The service disposes of conveniently located stops next to premium attractions. Also, the departures are the most frequent and waiting times the shortest of available providers. In addition, free extras, such as discounts at specified attractions in enclosed in the booklet and a free walking tour. Hence, you should book this bus tour if you are a shopaholic and willing to learn more about this amazing city. Explore the best top and iconic places in Paris at your own leisure with a 1, 2 or 3-day Open Bus Hop-On-Hop-Off Bus Tour. Captivate yourself with the scenery of the French capital city on board a comfy double-decker bus. Marvel at the city's artfully improvised streets and admire its beautiful landmarks such as the Eiffel Tower, the Louvre, and Notre Dame in 360-degree views aboard the open-top double-decker bus. Explore on foot wherever you find any top attraction interesting and hop-back on at the next stop ahead. 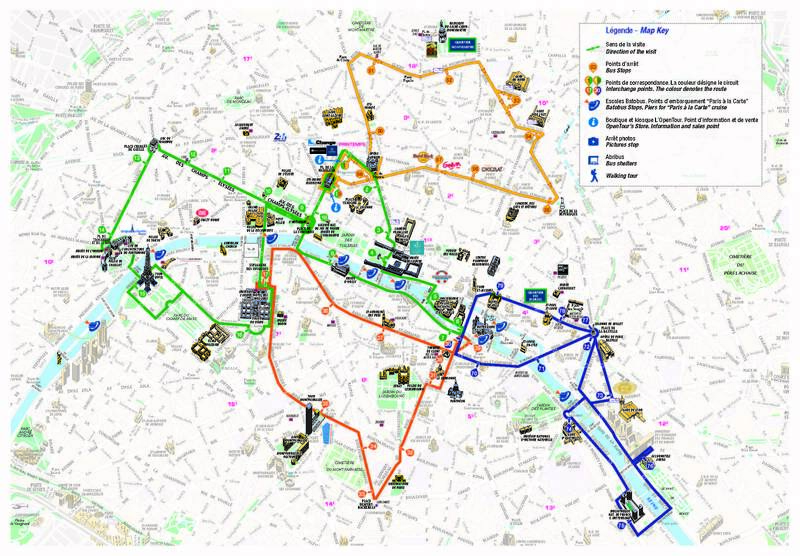 Explore Paris through four routes (Blue, Green, Red and Yellow Route) with your Paris Open Bus Hop-On-Hop-Off Tour ticket. Enjoy unlimited use of your Open Tours Paris Hop-On-Hop-Off Tour ticket for 1, 2 and 3-days consecutively. You get free complimentary walking tour experiences included in the Open Tours Paris Hop-On-Hop-Off Bus Tour. With the Open Tours Paris Hop-On-Hop-Off Bus ticket, you get special discount booklet along with your ticket. How much is a 1/2/3 Day Open Tours hop-on-hop-off bus? We are comparing the Best Paris Open Bus Hop-on Hop-off Tour Prices from leading online Tours and Ticket suppliers, try to find you cheap tickets prices on the market. Bastille Opera - 27 Place de la Bastille. The Open Tour Hop-On-Hop-Off Bus Paris is a 1, 2, or 3-day pass which gets tourists exclusive access to explore 4 lines, 38 stops and over 100 top attractions in the French capital. With this bus pass, tourists get to see some of the most admirable sights in Paris such as the Eiffel Tower, the Louvre Museum, Notre Dame Cathedral, the Arc de Triumph, see fascinating architectures like the Gare de l'Est, Gare du Nord, and Grands Boulevards. Tourists get to experience this tour in a comfortable open-top double-decker bus with free WiFi, audio guide in different languages for adults and children with the privilege to hop-off at any stop of interest to further explore on foot. The Open Tours Paris Hop-On-Hop-Off Bus ticket can also be presented using smartphones for convenience. Tourists are also provided with free map guides to help with walking tours on foot, and a discount booklet for restaurants, shops and leisure activities. Is the Open Tours Paris Hop-on-hop-off Bus Right for Me? This Open Tours Paris Hop-On-Hop-Off Bus is right for adults and children to explore and admire this beautiful European city. With a 1, 2, or 3-day pass; you get to see amazing sights and the narrow streets in the French capital including places like the Eiffel Tower, the Louvre Museum, Notre Dame Cathedral, the Arc de Triumph and many more. Smartphone tickets are allowed for the convenience of tourists to save time, you get to enjoy free onboard WiFi, headphones to listen to the onboard commentary in different languages for kids and adults alike. You can hop-on and hop-off at any stop that interest you. With your free map to guide you around the city, you can explore on Paris at your own pace with a discount booklet which helps you save more on leisure activities, shopping, restaurants and many more. It is a wonderful way to experience Paris. Experience Paris in grand style and visit some of the city's most amazing places, landmarks and attractions on a Big Bus hop-on-hop-off tour. 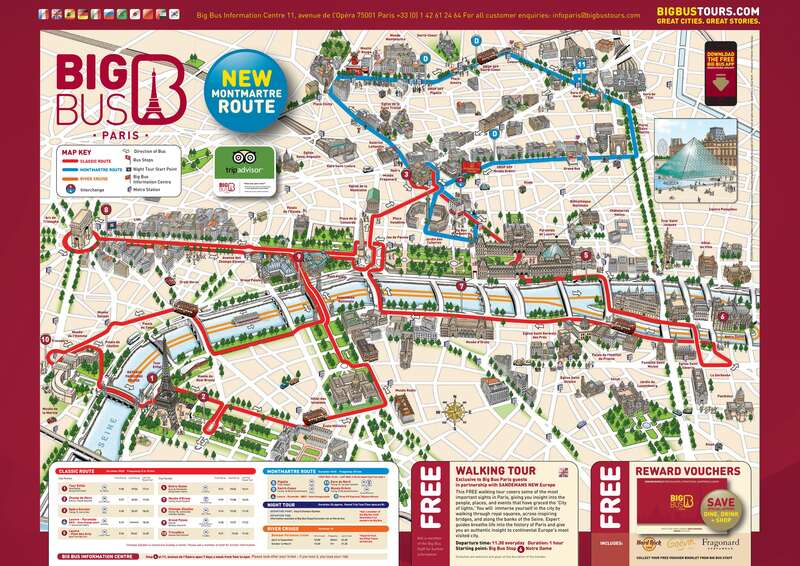 Get on the open-top double-decker bus and explore the Paris along 2 routes (red and blue) with over 10 stops combined. Listen to the onboard audio commentary in 11 languages with free headphones or live English guide in selected route buses. Get on and off the bus at any of the stops to see top attractions like the Eiffel Tower, Notre Dame Cathedral, the Arc de Triomphe, Montmartre and many more. Visit the Moulin Rouge, and the Basilica of the Sacred Heart to learn about its ancient past and enjoy skip-the-line access to one of the world’s largest Museums; the Louvre. With nearly 460,000 exhibitions and collections on display, the Glass Pyramid-shaped museum has artworks dating back to the 18th century on ancient Christian and Islam arts, and many other historical artefacts. Visit attractions & landmarks like the Eiffel Tower, Montmartre, Moulin Rouge, the Basilica of the Sacred Heart, Notre Dame Cathedral, the Arc de Triomphe, and more. There are no complimentary tours included in the Big Bus Tour + Louvre Museum. The Big Bus Tour + Louvre Museum includes a reward booklet to enjoy discounts at selected restaurants and attractions in Paris. How much is a 1/2 Day Big Bus Tour + Louvre Museum? NOTE: Children under 3 years ride for free and must be in the company of adults. You can start and end this tour from any of the stops approved stops. Big Bus Tour + Louvre Museum gives tourists access to a lot of attractions in the city of Paris. With a 1-or 2-day hop-on-hop-off bus pass, tourists will enjoy a ride on the open-top double-decker bus with panoramic views of the city. Free headphones are provided on the bus for tourists to listen to the audio commentary in 11 different languages, some selected route buses have live guides onboard as well. Also, on the bus tourists can share pictures online using the free Wi-Fi available and a free waterproof poncho is given to tourists during rains to continue their sightseeing activities. Hop-off the bus at any of the top attractions that interests you to along the 2 routes (red and blue routes), get up-close and personal; and hop back on at the next stop. The ticket also offers skip-the-line privileges to tourists at the Louvre Museum, where they can see the nearly 460,000 exhibitions and collection of art on display at the museum as far back as the 18th century. Some of the attractions to see include the Eiffel Tower, Notre Dame Cathedral, the Arc de Triomphe, Montmartre and many more. This is an amazing way to explore Paris! Is the Big Bus Tour + Louvre Museum right for me? Big Bus Tour + Louvre Museum is right for you. It is packed with a whole lot of attractions, landmarks and everything you need to know about Paris. The Big Bus hop-on-hop-off bus tour ticket gives you access to the open-top double-decker bus with free Wi-Fi and headphones to listen to the audio commentary on board the bus in 11 different languages. With this ticket, you will see the city in 360-degrees without missing an attraction or landmark on the bus. You can get off the bus and explore on foot t any of the stops of your choice and get back on at the next stop. You get to see attractions and places such as the Moulin Rouge, Notre Dame Cathedral, Basilica of the Sacred Heart, Montmartre, Eiffel Tower, the Arc de Triomphe, and many more. Even the rains cannot stop your sightseeing activities as you will be given waterproof ponchos to prevent you from getting wet while exploring. Nothing can get in your way with this ticket, the Big Bus tour grants you express entry into the Louvre Museum which is one of the largest in the world. It has over 450, 000 collections and exhibitions on display at the museum where you will learn about the history of Egyptians, Greeks, Etruscans and Romans. You will never miss a moment with this tour combo. Discover Paris onboard the Big Bus hop-on-hop-off tour with a 24 or 48-hour pass. Get onboard the open-top double-decker bus and experience the magnificent view of Paris in 360-degrees. Learn about the city's landmarks and attractions from the live guide onboard the bus, including recorded audio commentary in 8 languages using free headphones. Share your moments with friends and family with the free Wi-Fi onboard the bus and get off to see amazing sites like the Louvre or the Eiffel Tower, the Champs-Elysees, the Arc de Triomphe, and many other attractions. Enjoy a skip-the-line entry to the Eiffel Tower with 2 lunches and a glass of wine to relax while you see Paris from one of its most famous monuments. Also, enjoy another fast-track entry aboard the Boat and cruise along the Seine River for an hour to see the city of lights at night and its beautiful scenery. There are no complimentary tours included in the Big Bus Tour + Eiffel Tower & Cruise. There are no discounts included in the Big Bus Tour + Eiffel Tower & Cruise. How much is a 1/2 Day Big Bus Tour + Eiffel Tower & Cruise? NOTE: Children from 0-3 years ride for free and must be in the company of adults. Departure Point: You can start the Big Bus Tour Eiffel Tower & Cruise from 21 Avenue de la Bourdonnais. Buses return back to the start point. Big Bus Tour + Eiffel Tower & Cruise is a 1- or 2-day hop-on-hop-off bus pass with Skip-the-line access to the Eiffel Tower and a Boat Cruise on the Seine River. With this pass, tourists will see Paris, its top attractions, monuments and landmarks; aboard an open-top double-decker bus which is fully air-conditioned with free Wi-Fi access. Tourists can get off the bus at any of the 10 stops that catch their attention, to explore on foot and hop back on at the next stop. The pass offers fast-track entry to one of Paris' most famous monuments "the Eiffel Tower" with multi-course lunch at the "58 Tour Eiffel" restaurant on the first floor. Explore on your own from the first to the second floor of the Eiffel Tower and see Paris in a panoramic view with the Sacre Coeur, Les Invalides, the Montparnasse tower, Montmartre in clear sight and many more. Tourists will also enjoy skip-the-line access to the Seine River Cruise which is best during the evenings to see the city of light in the night time and its attractions from the river. Is the Big Bus Tour + Eiffel Tower & Cruise right for me? Yes! The Big Bus Hop-on Hop-off tour with express entry to the Eiffel Tower and Seine River Cruise is right for both adults, children, students and so on. It offers the best way to discover Paris in 1- or 2-days. With this pass, you will be able to get on the open-top double-decker bus and see the most amazing attractions, landmarks and monuments in Paris such as Saint-Germain-Des-Pres, the Louvre, the Place de l'Opera, the Eiffel Tower, the Champs-Elysees, Notre Dame Cathedral, and many more. You can share photos from the bus as you travel through the 10 stops around the city using the free Wi-Fi onboard. Headphones will be provided for you to listen to the audio commentary in 8 different languages with a live guide also onboard. Get off the bus and see attractions closer, and enjoy skip-the-line access at the Eiffel Tower's first and second floors where you will be eating 2 lunch course meals with a glass of wine. From the Eiffel Tower, you can see Paris in 360-degree with other attractions like the Sacre Coeur, Les Invalides, the Montparnasse tower, and Montmartre in sight. You can end your tour with another skip-the-line admission on the Seine River Cruise which is best for the night time to experience the city of light. See all the top attractions in Paris from the river without missing any moment. Duration: The duration of the guided tour is 1:30 hours. Such a good post. I should express that I am to a great degree roused by your article. I will extremely glad on the off chance that you can tell me more about your articles. I foresee seeing your new articles every day. I think many individuals like your articles and I will just express profound gratitude for sharing this incredible stuff. You have done truly incredible work.